The NBA regular season is winding down and I can’t wait for the playoffs to get rolling. However, there are still a few games left, including two great games tonight that will be on TNT. Miami (35-43) are 10th in the East and 1-game back of the Celtics for 7th place. Miami are 19-19 at home and they need a win badly to keep their playoffs hope alive, but will they beat Chicago? The Heat just snapped a 4-game losing streak by beating the Hornets (105-100), but this team isn’t playing good basketball. Chicago aren’t in good form either, as they’ve lost two in a row. 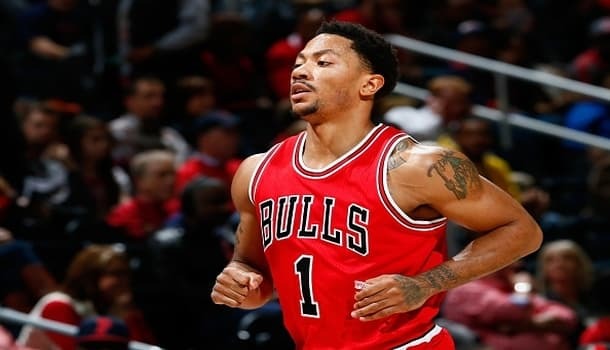 Chicago are firmly in the playoffs though, plus they’re ecstatic that Derrick Rose is back from injury already. He played last night against Orlando and will be able to play limited minutes tonight. Rose had 8 points, 8 assists and 6 rebounds in 33 minutes against the Magic. I don’t expect him to play as many minutes against the Heat, but he’s clearly healthy and ready to produce in the playoffs. Pau Gasol (12 points and 9 rebounds) was one rebound shy of recording his fourth double-double in a row against Orlando. With Bosh out, Gasol should be able to dominate the paint at PF. Goran Dragic has been playing great for the Heat, but they lack depth. Dwayne Wade and Dragic are relied upon to provide most of the scoring and I expect Wade to struggle against Jimmy Butler. The H2H series is 1-1 this season and strangely enough, the away team has won both games. I expect that trend to continue, as the Bulls have too much star power for a Bosh-less Heat to handle. Golden State (63-15) and Portland (51-27) are both in the playoffs in the West and this game is really meaningless in the grand scheme of things, but it’ll still be a great between with lots of superstars. I expect a lot of points, just like what happened in the last H2H meeting. These teams have played each other twice and the Warriors are 2-0 (2-0 ATS), while the over/under is split at 1-1. The first game only had 185 points, but the last game, which was last month, ended with 230 points. I’d be happy with something in between those totals and I expect this game to surpass 210+ points. We have two of the highest scoring teams in the NBA, as the Warriors rank 1st in points scored with 109.6 PPG and the Trail Blazers rank 10th in points scored with 102.8 PPG. Both teams are allowing close to 100 PPG too. Portland gives up 98.0 PPG (10th) and Golden State gives up 99.3 PPG (14th). In a meaningless game like this the offenses generally produce at a high rate. Stephen Curry has scored 24+ points in nine of his last ten games. Other GSW players haven’t been nearly as consistent, but the Warriors have scored 100+ points in 15 of their last 16 games. Damian Lillard is fresh off a 36-point performance against the Nets and LaMarcus Aldridge has been his normal consistent self. Wesley Matthews is the only player expected to miss this match-up. These are the only two NBA games tonight, but like every Thursday, these two match-ups will both be nationally televised on TNT. Get the best odds on the two games above, along with my free picks.